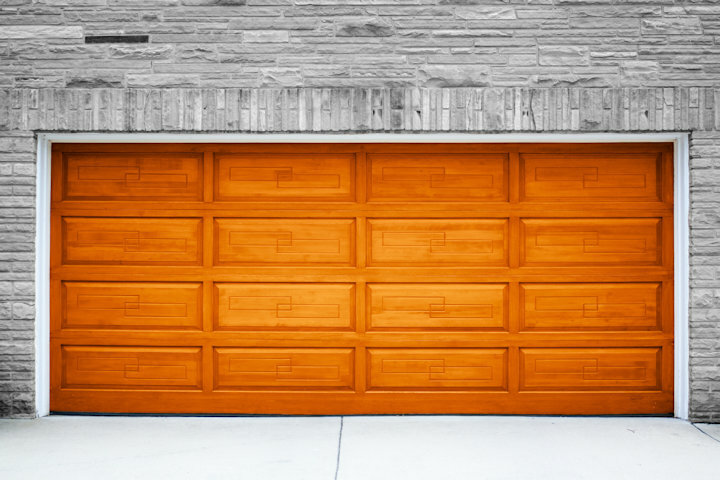 Wooden garage doors are beautiful when they’re well-maintained, but they’re also susceptible to the changing weather conditions that can wreak havoc on the smooth wood panels. When you notice water damage, rotting, bowing or other issues with your garage door panels, fear not. You can take steps to repair your garage door without ordering an expensive custom replacement door. It’s common for the bottom panels of a wooden garage door to begin to show water or insect damage, but you can learn to replace the individual panels of a garage door. Here’s how. Begin cutting out the quarter round on the inside of the garage door by scoring it repeatedly with a utility knife or preferably with an oscillating tool until all four pieces of “trim” are removed (if applicable to your garage door). Once the quarter round is removed from the borders of the interior side of the panel, you can knock out the panel with a hammer (hammering from exterior to interior since you did not remove the quarter round from the exterior). Once the panel is removed, you can take a chisel to smooth and clean up the area where the panel was previously installed. Then, apply a coat of the wood hardener around the area you just smoothed before installing the new piece of paneling. This step will help protect the wood from water penetration in the future. If you need to cut the new piece of panel (lauan plywood), cut it to size with a table saw or circular saw if available, or have it cut to size at purchase to eliminate this step. Paint and prime the new piece of panel. Fit the new piece of panel into the hole and use caulk and finish nails to attach the quarter round back around the interior of the panel to secure it in place. Caulk around the exterior side of the panel for added protection. Lastly, touch up any areas that need it by scraping and painting, and your new panel should be ready for duty. The above steps were for replacing a panel above the bottom rail of a garage door. It’s also very possible for the bottom piece of rail on a wood garage door to need to be replaced or repaired. Replacing this component is more involved, as it will entail supporting the door as you remove the entire bottom rail from it. If the piece isn’t too damaged, we recommend scraping rotted sections and using wood filler to patch rotted areas before repainting. Inspect for future signs of rot, and scrape and patch them immediately to prevent the damage from spreading as water leaks into cracks. Lubricate hardware yearly to avoid rusting. Replace worn seals (weatherstripping) if you start to notice light coming under the door while it’s closed. If your door is too deteriorated, it may be necessary — and likely less expensive — to replace the garage door entirely, but if you notice areas of rot or damage, use the steps above to repair your door before it’s beyond repair.